PULZAR SEMI SYNTHETIC MOTOR OIL is a thick, protective blended oil especially designed to extend the life of hard-working, high-performance gasoline engines at elevated temperatures and shear conditions. Formulated from high quality synthetic base oil and highly refined paraffin base stocks, the Viscosity Index Improver and other specially selected additives keep engines clean and offers superb wear protection in conventional and alternative passenger cars. 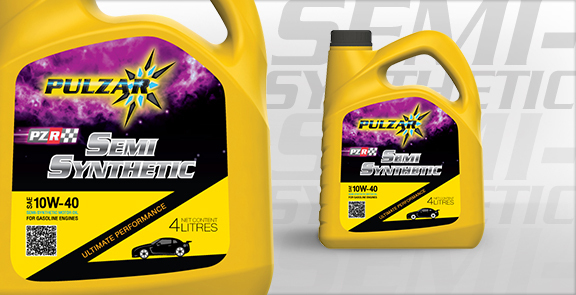 PULZAR PZR SEMI SYNTHETIC MOTOR OIL is designed for all gasoline engines where SAE 10W-40 motor oil is recommended. Its special formula makes PULZAR PZR SEMI SYNTHETIC MOTOR OIL an ideal engine oil for alternative energies such as CNG and LPG. It exceeds the performance requirements of API Service Classification SM.